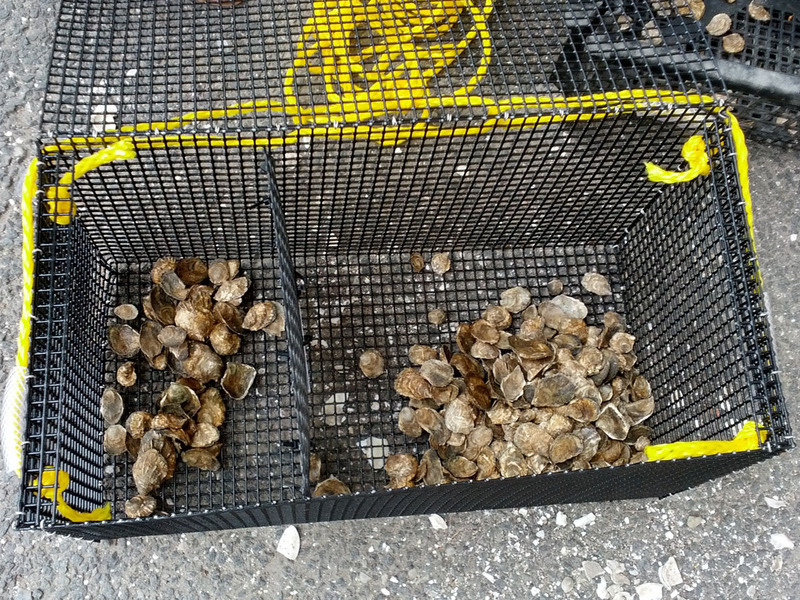 The baby oysters have been planted in the Hudson River; we hope they grow up big and briny! Though of course, these oysters are strictly NOT to be eaten. As part of the NY/NJ Baykeepers oyster gardening program, I signed up to care for an oyster garden for the next year, and to monitor it monthly to make sure the cage is in good condition. The program is open for anyone interested in learning about the oyster lifecycle and how they help clean our watershed. The Baykeepers held an orientation session last week for the oyster gardening program, and I stopped by to count out 300 oysters, each about the size of a quarter. Depending on the flow of nutrients in the water, they might grow out to 2-3″ in a year’s time…or the oysters might soften and die, like an oyster garden that was kept in the Gowanus Canal (a toxic Superfund zone). Each cage had two compartments, one section with 50 oysters which would be measured for growth, and another section with 250 oysters which would grow and hopefully spawn in warmer months. Program participants are required to collect data on the oysters at least three times a year, but it’s recommended to check on the cage monthly to make sure the rope isn’t fraying or your oysters aren’t being vacuumed up by a starfish. We all know that New York harbor’s water could be cleaner, but we’re about to find out just how it compares to the pristine waters of the Cape or eastern Long Island. Stay tuned for future updates on the oyster garden’s growth!